Berlin: Live HD news studio. 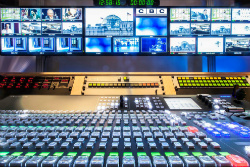 CBC has just completed a major modernisation of its news studio in Berlin to enable live transmissions and recordings in HD. Susanne Jumpelt, CBC sales representative, said, "This was the last major HD upgrade for CBC as our Cologne facilities are already HD." The Berlin studio, which is 280 square metres, is located in the heart of the city near to the Bundestag and the Brandenburg Gate. Susanne said, "As well as German clients, we also have a lot of international customers. For example, we've just had the German premiere of the new Twilight film in Berlin and so we had a lot of requests from clients in America and Canada." Although the studio has no uplink facilities on site, it is connected via HD fibre to the CBC headquarters in Cologne from where live satellite transmissions can be made.